EPF’s Annual 5-day 2018 Preaching Excellence Program Was a Success! The EPF’s Annual 5-day 2018 Preaching Excellence Program was presented at the Roslyn Retreat Center in Richmond, VA May 27-31 to a capacity audience of 50 hand-picked seminarians representing 14 seminaries and diocesan formation programs across the US and Canada. Seminarians are nominated by their Deans to fill a limited number of places allocated to each seminary, with tuition and travel 80% funded by the EPF. This year’s PEP earned recognition from seminary deans and the attending seminarians as a high mark in the decades-long evolution of the Conference. Distinguished Faculty included Rt. Rev. Robert Wright, Bishop of Atlanta, Rt. Rev. Susan Ellyn Goff of Bishop Suffragan of Virginia, Rev. Sam Wells of St. Martin in the Fields, London, UK, and the Very Rev. Samuel Candler, Dean of Atlanta Cathedral, Georgia, all of whom in addition to delivering plenary addresses, stayed on to meet informally with the students at mealtimes and between scheduled sessions. 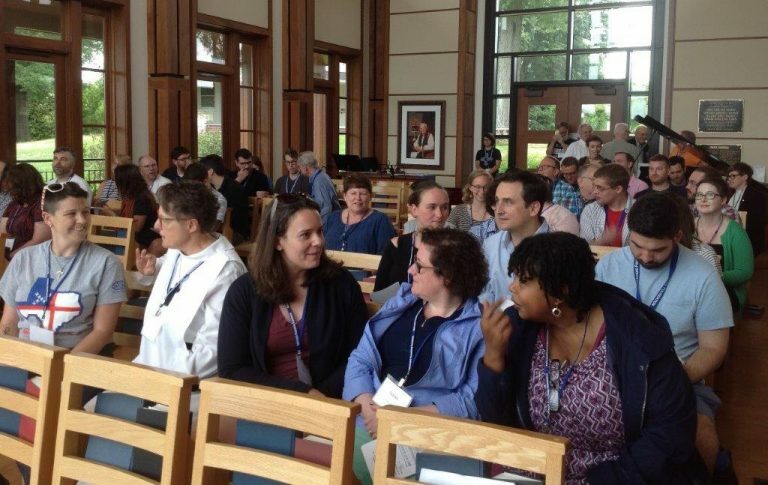 This mix of programmed sessions and informal exchanges with nationally recognized preachers in a relaxed residential environment is a distinguishing quality that makes PEP such a memorable and valued experience in the context of a seminary. Included in the student body for the first time in 2018 were postulants from non-seminary diocesan formation programs, a parallel track for educating future clergy and a growing source of new ordinands, particularly in non-urban areas where the economics of a parish calling are incompatible with the financial burden of a debt-financed seminary education. The PEP format that combines inspiring keynotes and plenary addresses interwoven with practical workshops and moderated preaching groups continues to be an effective conference design that elicits consistently positive feedback from PEP participants in follow-up surveys. With an 84% overall response rate to this year’s survey, 95% of respondents rated their overall PEP experience as Satisfied or Very Satisfied and 84% stated that their PEP experience met or exceeded their expectations. The post-conference survey also collects diagnostic information on individual speakers and workshops which enables the Foundation to fine-tune the format, speaker selection and the content of the conference year-to-year. This year a new panel discussion The Worst Sermon I Ever Gave and What I Learned From It successfully called upon the distinguished faculty at PEP to share some of the more challenging moments in their preaching careers. This was sufficiently well received that it will be repeated for a larger audience of clergy and church leaders at the 2019 conference of the Consortium of Endowed Episcopal Parishes. The cost to the EPF per PEP student in FY 2017/8 was $1,790 exclusive of EPF staff expense. Of this, $300 is paid between the students, their seminaries and their dioceses, for a net EPF outgo of $1,490 per student. The FM Kirby grant made a significant contribution toward the funding of the total $74,500 out-of-pocket cost of the 2018 PEP program.